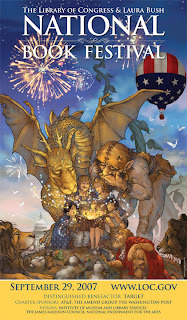 The Star-Lit Children's Literature Festival has been an annual event in the Dallas area since 2003. Proceeds from from the one day event benefit the Dallas Bethlehem Center. Breakfast with the Authors tickets are $30 but the rest of the day's events are free to the public this year. If that were not reason enough to attend, uber-blogger, Cynthia Leitich Smith and Greg Leitich Smith are among the authors and illustrators presenting this year. I have dreams of attending this and the Texas Book Festival every year but events on the home front seem to always conflict. Maybe this will be my lucky year? Cynthia will also be presenting at the 2007 National Book Festival in Washington D.C. this year. The Mercer Mayer's poster is beautiful. I picked up a copy of last year's poster at the Library of Congress in May. These would be so interesting to collect.